This little Aussie is highly intelligent and brave, a good watchdog in spite of its size. What is the origin of the Australian Terrier? Early settlers to Australia brought several types of terriers with them. 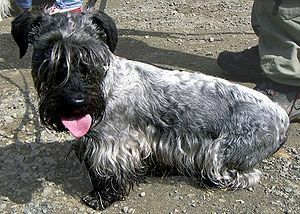 In the 19th century these were crossed with several British terriers such as the Skye, Dandie Dinmont, Cairn and Yorkshire. 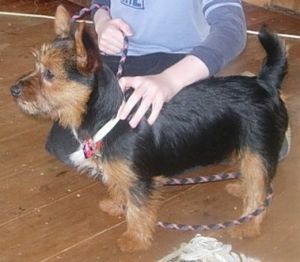 The resulting Australian Terrier proved very useful as a vermin hunter. It is also a strong adversary against Australia’s large population of poisonous snakes. What does the Australian Terrier look like? This Aussie is 9-11 inches tall and weighs 9-14 lbs. The head is long with a silky topknot. Eyes are oval and small, dark brown in color. Ears are small, pointed and erect. The tail is docked where this practice is allowed. The coat is harsh, long on the body, shorter elsewhere. Colors are all red, blue with tan markings. Brush several times a week. What is the temperament of the Australian Terrier? The Australian Terrier is a highly intelligent dog, brave and alert. Firm, consistent, positive obedience training and socialization are recommended. When raised with other dogs and pets, they do well together. However be cautious with pets already in the home, especially cats. Aussies are good with children who treat them kindly. They adapt well to apartment living as long as they have daily walks as they are very active little dogs, always on a leash unless in a secure area. This terrier is not afraid of anything up to and including very large dogs and should always be leashed when out for a walk. Anything that moves is fair game to the Aussie and s/he will take off at a run after the object of interest. 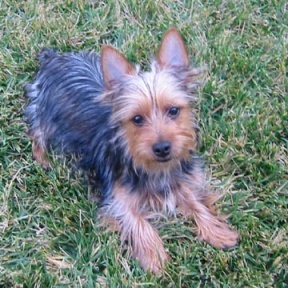 What is the Australian Terrier used for? The Australian Terrier can be taught to perform tricks easily. They also compete in agility and tracking trials. Aussies are excellent little watchdogs. They are used to harsh environments of Australia and can tolerate them. They are loving, affectionate companions with their family.